You allready applied for Aadhaar? '' I applied for Aadhaar but I forgot my Aadhaar Acknowledgement Number'', you lost your Aadhaar Card ? Still you not received your Aadhaar Card, those peoples are don’t worry now UIDAI provide facility for Download your Aadhaar online. Peoples are struggling for Aadhaar Card at this scenario UIDAI take a step ahead to launch e-Aadhaar print from online, e-Aadhaar is equal to original Aadhaar Card once you enroll at any Aadhaar center in India then keep your Aadhaar Acknowledgment handy, with this number you can direcly dowd your Aadhaar Card from online. Allready you applied for Aadhaar still your not reciving it so need to waiting for postman just you go to Aadhaar site and download the e-Aadhaar letter print out using with your Aadhaar Acknowledgement Number its enough for all uses in all aspects, this e- Aadhaar have same information which we have on hard copy Aadhaar issued by UIDAI. This ''online e-Aadhaar'' also having your photo, age,date of birth, and your full address if you take it as a cloure print it would be better for visibilty of Aadhaar get rich look and easy to apply for all indeeds, some organisations and Banks are accept this e-Aadhaar as a id proof, because its having UID unique identification Number so official its acceptable . 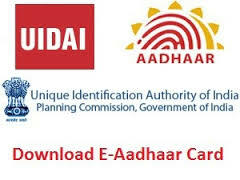 It’s a good convinent way for get , retrive your Aadhaar from online provided by Aadhaar UIDAI unique indentification authority of India so your waiting is ends here for Aadhaar. Download e-Aadhaar Card online, No need to wait for Aadhaar, Aadhaar Card on your fingertips. e-Aadhaar print is not considered as original Aadhaar card in all the Govt. institutions. In RTO if you show your e-Aadhaar print as your identity/address proof, then the RTO inspectors will ask for its original card. If you do not have it, they won’t approve your Driver's License application. I applied for my Aadhaar card in May 2013, got my e-Aadhaar in July (2013). Now its end of March (2014) and still i haven’t got my original Aadhaar Card by post. If Goverment is bringing any facility for the citizens of our country, then it should be fast and full proof. If they will only be so contradicting in their statements and behaviours, then how will the citizens give their voluntary participation in helping Goverment.